Scorcher, the fourth book in a series that includes Tropical Heat, Flame and Kiss, again features Florida private detective Fred Carver. A serial killer is on the loose, a maniac wielding a homemade flame thrower fashioned from a scuba tank. He has murdered three people - and one of them is Carver's eight-year-old son. Carver will do anything to find his son's killer and exact a father's revenge. All clues point to the brilliant schizophrenic son of one of Florida's wealthiest families, and when the suspect goes on the run, Carver sets out to hunt him down. 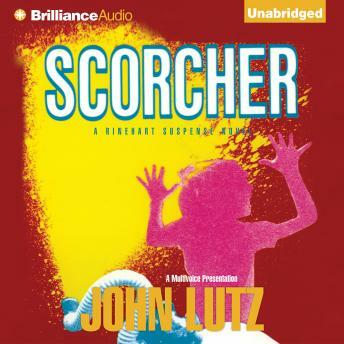 A gripping story of long-buried secrets and burning hate, Scorcher is a taut, explosive and thoroughly unforgettable mystery.